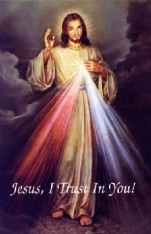 The Divine Mercy Chaplet is a prayer said using a chaplet or ordinary rosary beads. Say the Our Father, one Hail Mary and the Apostle's Creed. The pale ray of light represents the Water, which cleanses our souls. The red ray represents the Blood, which gives life to our souls. As He hung on the cross, Christ’s agonizing heart was opened by a lance. Then these two rays issued forth from the depths of Christ’s tender mercy. Finish with the Sign of the Cross.